In-form galloper Geodesic was cheered on from around the country as he toughed it out to the line on Wednesday, recording his second Sale 2232m victory in a row. 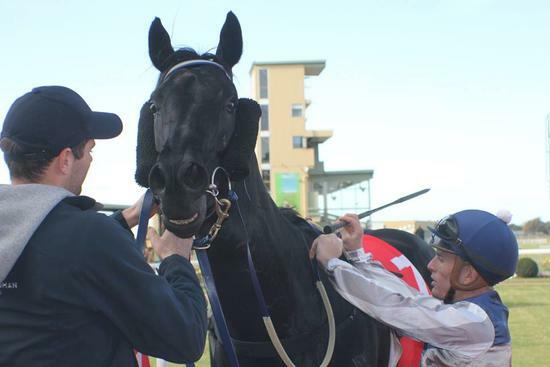 Successful at BM58 level two weeks ago, the handsome son of Domesday was up in class and weight but was still too strong - always travelling well for Jarrod Fry who had him nicely positioned off the speed. Enjoying a good trail into the race from before the turn, Geodesic hooked out wide into the clear straightening and began a winning run - ducking in slightly in response to the favourite Moss N Bolt shifting ground. It was a battle between the two over the final furlong with our boy sticking his nose out right where it counted! Geodesic's third success from nine starts for the stable, the win was cheered on by his enthusiastic owners around the country. Such as Lindsay Harm who watched on his computer from his work in Brisbane... "he always looked like he was going to go close and when he hit the front on the line I had a feeling of satisfaction followed by elation." Meanwhile Tracy McNeill was at home with husband Mark in South Australia... "the butterflies in my stomach were building up to a frenzy as they entered the gates!" "When they got to the 500m and the favourite took off I couldn't believe how Marty stretched out his neck and set out after him. Rounding the bend you could see a dogfight brewing and the noise level in the lounge room was sky high. My trusty cushion was getting a belting as Marty gained the upper hand and got in by a nose." "Then the tears flowed, a feeling of utter joy overtook me and we looked at each other speechless but ecstatic for minutes after... thanks Marty, another photo for Marty's wall. What a day!" Michael Scheele was on course at Sale, heading towards the gates to watch the jump before heading towards the finishing line... "I thought the other horse had got the bob of the head but Mitch was pretty confident that the race belonged to Marty... and so it proved to be. It made the trip home all the more enjoyable!" On holiday in Noosa Karin MacNab enjoyed watching her horse relax so well as he strolled around the mounting yard - "he is so much calmer and more collected than he used to be, more mature and decidedly grown up now... and so stunning!" "I yelled from so far away and my heart was thumping." Also in South Australia was Phill Mueller... "I was home in my recliner, watching on big screen, and setting the digital recorder to record as I like to play races back to analyse. From the 400m mark, he had two jockeys - Jarrod Fry and me!" "When he hit the front, man I was on cloud nine. It is such a high being part of his syndicate of owners. It's what makes racing great... he is almost a Winx to us." Kristen Manning and Vin Lowe watched on from Melbourne and there was considerable jumping around in that lounge room as well with pride being the overriding emotion. "This horse has come so far," Manning said, recalling a day that he was so stressed at the races that he began to roar, attracting the attention of stewards! "He has always been a big baby but under Mitchell's care he has settled right down which is enabling him to fulfill the potential he has always shown." Geodesic's owners are a patient bunch with the once difficult gelding taking a while to come into his own with Mitchell noting that "it took us a preparaton to work him out." "He is a horse who requires hard work all the time, if you back off him too much he comes to the races and proves a handful for the strapper and then blows out early in his races." "But he is building in confidence and is now looking for 2400m and beyond." Jarrod Fry was happy to be aboard for a second win, noting that "he travelled beautifully and had plenty left coming to the corner." "He just switched off a little bit when he got there but he still let down well." "He probably let down better on the softer track last time, he prefers a bit more sting out but to his credit he got the job done."